In the 17th century, the area north of the Ohio River had been occupied by the Algonquian-speaking Shawnee and some Siouan language-speaking tribes. Around 1660, during a conflict known as the Beaver Wars, the Iroquois seized control of the Ohio Country, driving out the Shawnee and Siouans, such as the Omaha and Ponca, who settled further northwest and west. The Iroquois conquered and absorbed the Erie, who also spoke an Iroquoian language. The Ohio Country remained largely uninhabited for decades, and was used primarily as a hunting ground by the Iroquois. In the 1720s, a number of Native American groups began to migrate to the Ohio Country from the East, driven by pressure from encroaching colonists. By 1724, Delaware Indians had established the village of Kittanning on the Allegheny River in present-day western Pennsylvania. With them came those Shawnee who had historically settled in the east. Other bands of the scattered Shawnee tribe began to return to the Ohio Country in the decades that followed. 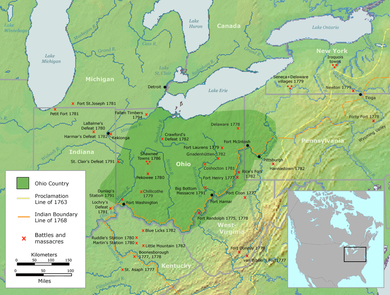 A number of Seneca and other Iroquois also migrated to the Ohio Country, moving away from the French and British imperial rivalries south of Lake Ontario. The Seneca were the westernmost of the Iroquois nations based in New York. In the late 1740s and the second half of the 18th century, the British angled for control of the territory. In 1749, the British Crown, via the colonial government of Virginia, granted the Ohio Company a great deal of this territory on the condition that it be settled by British colonists. With the arrival of the Europeans, both Great Britain and France claimed the area and both sent fur traders into the area to do business with the Ohio Country Indians. The Iroquois League claimed the region by right of conquest. The rivalry between the two European nations, the Iroquois, and the Ohio natives for control of the region played an important part in the French and Indian War from 1754 through 1760. After initially remaining neutral, the Ohio Country Indians largely sided with the French. Armed with supplies and guns from the French, they raided via the Kittanning Path against British settlers east of the Alleghenies. After they destroyed Fort Granville in the summer of 1756, the colonial governor John Penn ordered Lt. Colonel John Armstrong to destroy the Shawnee villages west of the Alleghenies. The British defeated the French and their allies. Meanwhile, other British and colonial forces drove the French from Fort Duquesne and built Fort Pitt, the origin of the city of Pittsburgh, Pennsylvania. In the 1763 Treaty of Paris, France ceded control of the entire Ohio region to Great Britain, without consulting its native allies, who still believed they had territorial claims. Colonies such as Pennsylvania and Virginia claimed some of the westward lands by their original charters. In an attempt to improve relations with the Native Americans to encourage trade and avoid conflicts with colonists, George III in his Royal Proclamation of 1763 placed the Ohio Country in what was declared an Indian Reserve, stretching from the Appalachian Mountains west to the Mississippi River and from as far north as Newfoundland to Florida. The British ordered the existing settlers (mostly French) either to leave or obtain special permission to stay and prohibited British colonists from settling west of the Appalachians. The area was officially closed to European settlement by the Royal Proclamation of 1763. The Crown no longer recognized claims that the colonies made on this territory. On June 22, 1774, the British Parliament passed the Quebec Act; it annexed the region to the province of Quebec. Colonists in the Thirteen Colonies considered this one of the Intolerable Acts passed by Parliament, contributing to the American Revolution. Despite the Crown's actions, frontiersmen from the Virginia and Pennsylvania colonies began to cross the Allegheny Mountains and came into conflict with the Shawnee. The Shawnee referred to the settlers as the Long Knives. Because of the threat posed by the colonists, the Shawnee and other nations of the Ohio Country chose to side with the British against the rebel colonists during the American Revolutionary War. Americans wanted to establish control over the region. In 1778, after victories in the region by the Patriot general George Rogers Clark, the Virginia legislature organized the first American civil government in the region. They called it the Illinois County, which encompassed all of the lands lying west of the Ohio River to which Virginia had any claim. The high-water mark of the Native American struggle to retain the region was in 1782: the Ohio Nations and the British met in a council at the Chalawgatha village along the Little Miami River to plan what was the successful rout of the Americans at the Battle of Blue Licks, south of the Ohio River, two weeks later. In 1783, following the Treaty of Paris, Great Britain ceded the area to the United States (US). The government immediately opened it to settlement by American pioneers, considering it unorganized territory. The Ohio Country quickly became one of the most desirable locations for Trans-Appalachian settlements, in particular among veterans of the Revolutionary War. In the Treaty of Fort Stanwix and Treaty of Fort McIntosh the US fixed boundaries between United States and tribal lands. The Shawnee and other tribes continued to resist US encroachment into their historic lands. This resistance led to the Northwest Indian War after the Revolution. Connecticut claimed a strip of land across the northern part of the region delineated by the westward extension of its northern and southern state boundaries, called the Connecticut Western Reserve. Pennsylvania claimed land as a westward extension of its boundaries. States' claims were ceded to the United States between 1780 and 1786. In July, 1787, most of Ohio Country, the southern peninsula of what is today the state of Michigan and westward Illinois Country were incorporated as the Northwest Territory. ^ "Ohio Territory" is a misnomer - it was never an organized territory of the United States or any other nation. ^ MacCorkle, William Alexander. "The historical and other relations of Pittsburgh and the Virginias". Historic Pittsburgh General Text Collection. University of Pittsburgh. Retrieved 16 September 2013. ^ "Addresses delivered at the celebration of the one hundred and fiftieth anniversary of the Battle of Bushy Run, August 5th and 6th, 1913". Historic Pittsburgh General Text Collection. University of Pittsburgh. Retrieved 16 September 2013. This page was last edited on 29 March 2019, at 10:28 (UTC).